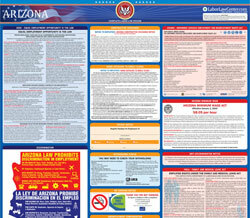 The Earned Paid Sick Time Poster is a general labor law poster poster by the Arizona Industrial Commission. This is a mandatory posting for all employers in Arizona, and businesses who fail to comply may be subject to fines or sanctions. This poster describes a new Arizona law requiring one hour of paid sick time for every 30 hours worked. It appears you don't have a PDF plugin for this browser. Please see the link below to download arizona-az-earned-paid-sick-time-poster-2017.pdf. a ny person employed by the State of Arizona or the  United States government. accrue or use 24 hours of earned paid sick time per year . accrue or use 40 hours of earned paid sick time per year . Employer s are permitted to select higher accrual and use limits . or (3) informing any person of their rights under the Act. the Act . Violations of the  Act may result in penalties. 85007- 2022; (602) 542- 4515.